For clarification, the Natural Light photos are 2 pieces of new Cypress. Both sanded with 3 coasts of Natural Light per manufacturer�s directions. Every piece of bare section of Cypress coated. Then, one of them was placed outdoors. The one on the left is the control. The one on the right was set outside for roughly 1 year and here are the results. As you can see, the Natural Light failed. I would expect better results at $100/gallon. Please post some Dobbkins photos so we can all see your results. This is the company who supplied the finish for the Massaro exterior wood trim. Not sure how it worked out. All the posted information about the wood finishes is informative and interesting. Here at the Weltzheimer House I am trying to get Sikkens approved as the finish of choice for the exterior. The house is built from redwood and most of the old finishes have fallen off. The most exposed areas of the house have turned a charcoal black. 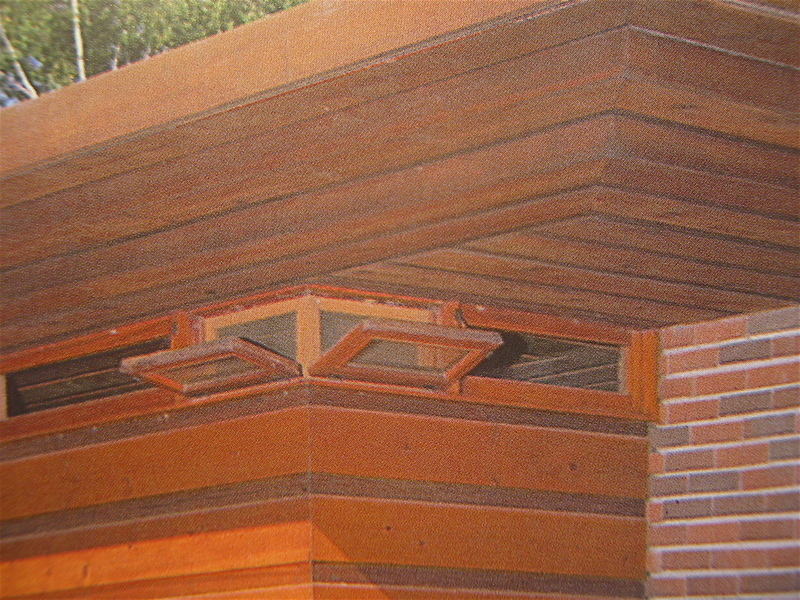 Restorers of California bungalows with redwood exteriors claim that the black surface is natural aging and should be considered the 'patina of age'. When I made the missing screen doors for the building I used Sikkens teak because the color so closely matched the orange shellac of the interior finishes. FLW was not a preservationist, like many here he advocated new building especially because he was so very good at it. must be sprayed (they do not have a brush-able product) and is not recommended for exterior application. If Massaro used it on his project, I would not be surprised if it has already failed on all exterior surfaces. Perhaps some one, who has visited lately, could give us a condition report. Here are Massaro's french doors. Not sure what they look like now. Here is a pic of the cottage too. Not sure what product is used. I believe that there is a fair amount of misinformation in this thread. 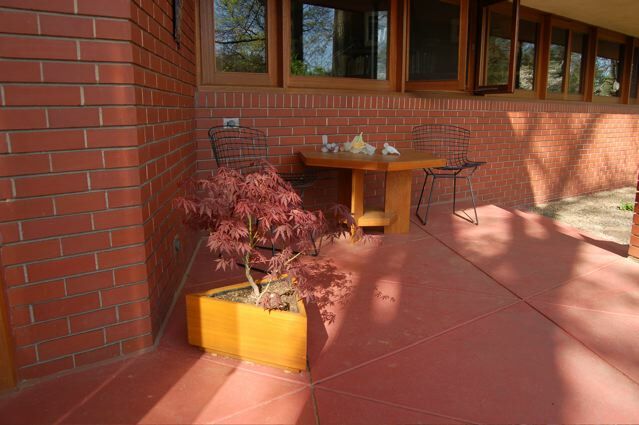 To determine accurately what was the original finish on a FLW building one would have to find unexposed and concealed stained wood trim and have it tested and evaluated in a laboratory by experts. 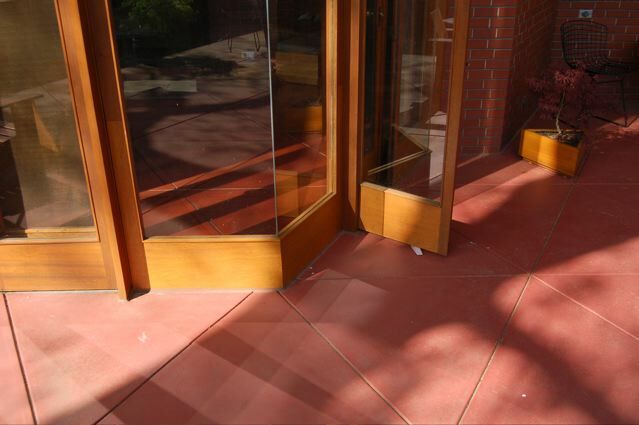 The appearance of finishes change over time when exposed to the elements. It takes professional expertise to evaluate finishes and reverse engineer original FLW finishes. If not done properly products like Sikkens finishes can yield disastrous unreversable results that are not authentic. I gather that the thrust of inquiry here and elsewhere may not be to replicate the original finish, but to select something that will produce a handsome and (somewhat) durable result -- and perhaps deal with the irregular appearance of old and weathered wood. I hope to be corrected if I am mistaken in this. Of course, different owners may have different goals for their respective houses -- just as each house will have a different history and a different original finish treatment, if any. One of the first of the relatively recent restorations, Jacobs I, was at first shocking to see; the orange-y color of the new exterior finish was undeniably bold, but it at least made uniform the no-doubt varied color of the weathered and long-untreated (?) pine and redwood, bringing the boards and battens into a new harmony. SDR is correct that many owners are not trying to replicate an original exterior finish which was not performing as expected. 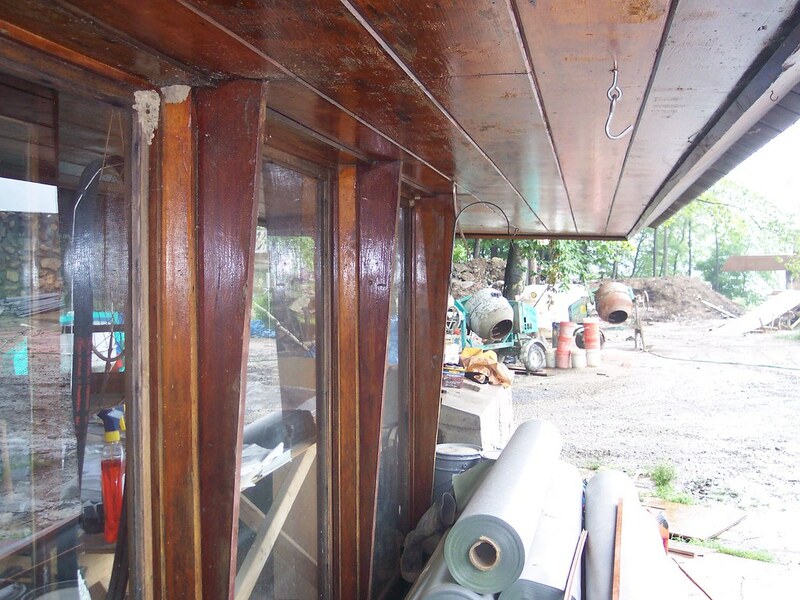 The only original Spar varnish finish intact and which still exists on the Dobkins house is in the carport (which receives very little or no weather to speak of and of course no direct sun light.) Even if the early applications of Spar finish would not have checked, and or peeled off the wood, the color would have changed to a very deep gray- black. furthermore it is a closed finish which will not expand and contract with the wood. Sikkens does receive a bad rap from time to time, but I still have not found a better alternative exterior finish. This product is no more "unreversable" than varnish or an opaque stain. I have removed all three finishes, and applied new finish numerous times. I had the chance last weekend to visit Jacobs I with the owner. We discussed many maintenance and restoration issues that most trained architects could not grasp because these houses are so unconventional. 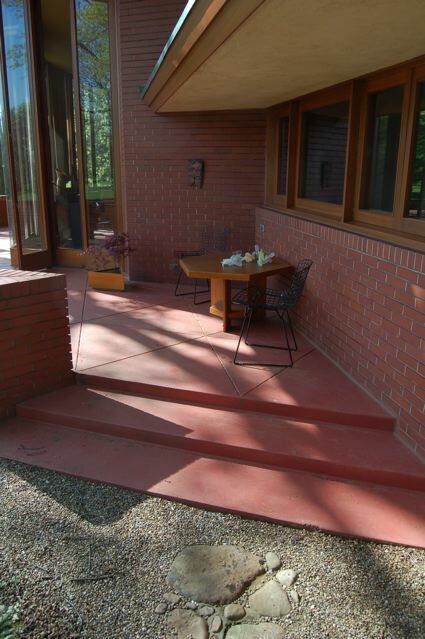 The product Jacobs I used on the exterior was Osmo �Wood Oil.� The results looked tremendous. 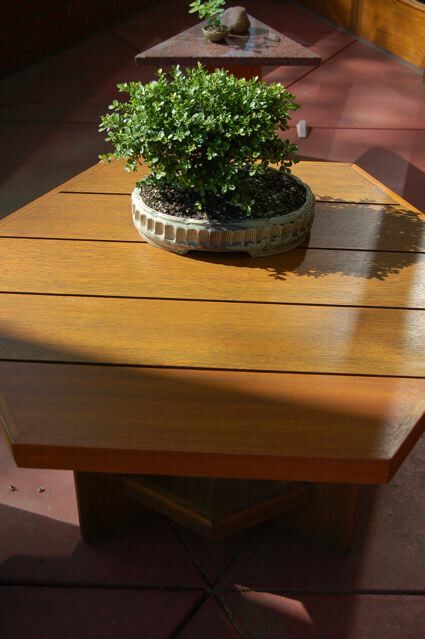 Wood Oil does not peel, chip or fade like the current Sikkens Cetol product. It allows the wood to breathe and the homeowner does not become a slave to the house. I am leaning towards using the clear on Haynes. It just might be the product I have been looking for. The problem with the Clear Oil is that it is semi-gloss. You may wish to look at their other oil products with a softer sheen. As you have been doing, it is prudent to make tests. It stands to reason, I suppose (unfortunately), that exterior glossy surfaces will be most resistant to degradation -- just as interior glossy surfaces are most easily cleaned and least likely to accumulate dirt and moisture. The traditional "brightwork" (varnished wood) on boats is as glossy as possible, no doubt for this reason. I agree that lower-gloss surfaces are more "natural," and attractive. I have a few questions about Osmo "Wood oil". When was it first applied to Jacobs 1 ? and has it been replenished since first application? What is the recommended procedure for future maintenance? What is in the product, that protects against damaging UV rays? You may want to contact the owner since I do not have exact answers. I think it was first applied in the 1980s when the house went under a complete restoration. I would assume it has been re-applied. I suggest looking at the Cabots product for details. The owner told me to stay away from Cabots since Osmo was more superior.